We visited PEI in the off-season which was good for some things--few tourist crowds (which is why we are the only ones in the photos, there was barely anyone else there! ), the B&B was a steal--but bad for others. Visiting off-season meant that many restaurants were closed or had very limited hours. 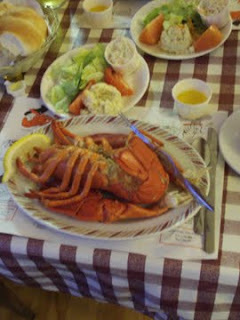 But even with the restaurant challenges, we were able to partake in a PEI special--a lobster supper. Maybe because of my Asian heritage, I have never experienced a church dinner or a spaghetti supper. So this was a very new experience for me. As we entered, we purchased a ticket for what size lobster we wanted (I opted for a 1.5 pounder). Then were led to an enormous cafeteria, filled with locals and tourists and tables covered with plastic checked tablecloths. 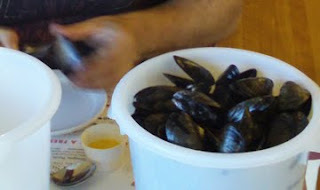 After sitting down, we were treated to all you could eat chowder, mussels, potato salad, and coleslaw. They brought everything to you in big buckets which they quickly refilled until you requested them not to. 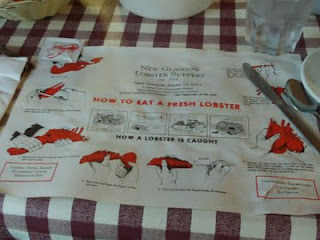 Then, just as you were about to burst, a plastic bib was tied onto you and the lobster came out. And it was so good! The meat was so tender and juicy! But rather messy. I was glad of the plastic bib, which everyone seemed to wear without embarrassment (though Squatchie refused to put one on). It was a dinner of sloppy yet tasty excess--just as eating lobster should be, now that I think about it. I suppose that is why Lucy Maud never mentioned lobster suppers in any of her books. She probably couldn't imagine Anne in a plastic bib anymore than I could.